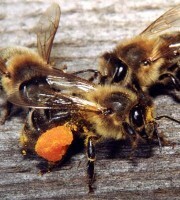 Bees feeding is needed during their fasting, and in order to induce them to conclude brood when there is no income from natural nectar sources. Feeding bees with syrup is undesirable because it is expensive, difficult and can cause theft of bees. In the spring it is better to feed dry, crystallized sugar on a piece of paper, putting it to the frame. In some cases, the feeding of bees is needed and in the fall, when it was pumped too much honey from a hive (even from the brood nests). 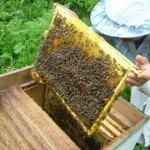 With such a large pumping of honey the bees do not get any savings because the sugar syrup is no substitute for honey. In areas where there is no autumn harvest, it is desirable to apply the stern extensions. When natural resources of the family of bees consist of low-grade or honeydew honey, it is quite possible to pump out honey of the combs and feed the bees with sugar syrup. However, in recent years, more and more beekeepers leave quite mature and well-sealed honey for bees, collected from various sources. Very rarely in winter bees die from such food. Usually the bees are fed with sugar beet or cane sugar in the form of sand. For the same purpose sometimes we use brown sugar, but it is less suitable, since it contains gum, harmful to bees . Corn sugar and glucose also can not be given because of the gums. 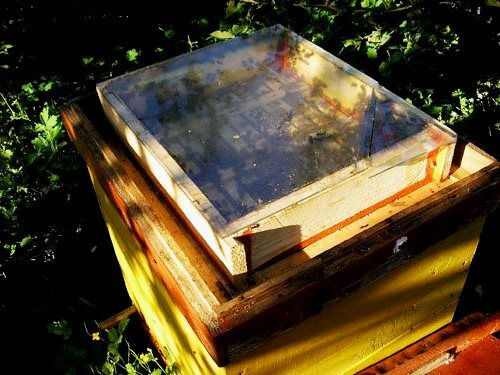 If in the apiary there is not sealed honey combs, you can prepare candy from pure sugar and place it on the frame. In extreme cases, if the hive is wet or bees fly you can put pieces of dry sugar over the framework. Bee feeder with tin lid. It is comfortable and at the same time the cheapest tin feeder for 2.25 or 4.5 kg of syrup. You fill the feeder with syrup, consisting of two or two and a half parts of sugar and 1 part of water.The density of the syrup depends on the temperature conditions. In cold weather, the syrup should be thick and warm. To feed the family you should put the empty supers in the hive. Tin feeder with syrup you put directly over the club and cover it with the old bag so warm air does not go. Some strong families can consume 4.5 kg of syrup per day. If the bees eat slow, you should replace the cold one with the warm. Feeding in winter. 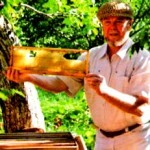 In recent years, more and more beekeepers leave for the winter 25 – 35 kg of sealed honey in the comb. Usually the family rarely uses 35 kg of honey during the winter. However, in some years, with the late spring and the long absence of harvest bees can die if they are left in the fall with little of honey. If the bees eat not over 25 kg in the winter, you leave 10 kg of honey for raising of brood in early spring. 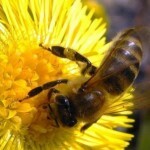 In some years, the harvest is not enough, and the bees can not collect a sufficient amount of food for the winter. 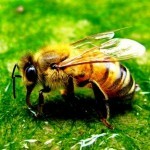 You have to feed the bees with sugar syrup, consisting of 2 parts of sugar and 1 part of water. For every 9 kg of sugar you add 1 teaspoon of tartaric acid to prevent crystallization. The first time the syrup should be given at the beginning of September. If later again the warm weather comes and the bees start to raise the brood, they are given a second feeding. Whatever feeding bees you make, you never break their formed winter club. Honeycombs with syrup or candy may not be placed in the center of the nest, they must be set on both sides of the winter club. 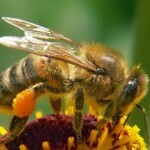 In most of the eastern regions of the United States and in some areas west of the Mississippi River you can do without winter feeding bees with syrup. In areas where there is a fall harvests from goldenrod and asters and spring harvests from dandelion, syrup feeding is not required in a good weather. For late fall feeding it is best to use cans feeders with open lids. Each feeder can hold 4.5 kg of honey. If a family at the same time requires a lot of syrup in one hive – you put 2 or 3 feeders. Feeders are installed in inverted position on cells in the empty supers. The easiest way is to fill in a tin with 5 – 10 kg of sugar and then walk along the rows of hives of bees and feed. 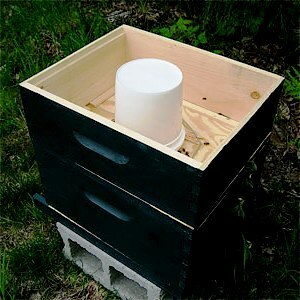 To give the family 1 – 2 handfuls of sugar, you raise the top cover and remove the vent for the bees. Sugar is sprinkled around the hole. If the bees are able to fly and find water, they eat all sugar. 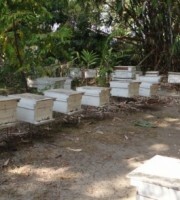 This method of feeding bees is especially appropriate in the periods prior to the main honey flow, when many families are starving and on the verge of death. With sufficient moisture in the hive and daily flight the bees gradually eat sugar on a piece of paper, set on the frame. Danger of attacking of thieves is excluded. 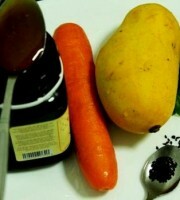 An unpleasant work for the preparation of syrup is excluded also. Feeding with dry sugar received a wide distribution from 1945. 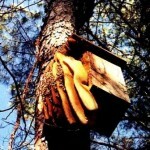 Beekeepers surprised that such a simple method was previously unknown. However, in the early 70’s A.I.Rut fed bees with refined sugar. Rut put the pieces of refined sugar on the frames against the club between the upper and lower body. In winter there is enough moisture to convert sugar to syrup in the hive, bees stored it in the cell. Rut noticed that in cold weather or lack of moisture bees do not always use all the crystallized sugar. Sugar fell between the frames and disappeared. Then Rut started to produce a solid candy. He poured warm candy onto the frame. 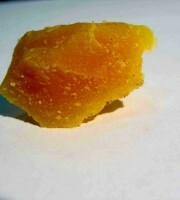 After solidification the candy replaced cells with a sealed honey, but without pollen. Instead of the pollen Rut added to candy wheat or rye flour. Soy flour, which has a high nutritional value, is better suited for this purpose. 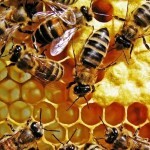 Bees that have even a small amount of honey or syrup in the hive, often do not pay any attention to the dry sugar. But as soon as there comes a real need, the bees begin to make a syrup from sugar, if they do not suffer from lack of moisture. There are hundreds of different types of bee feeders. Many of them are very complicated and inconvenient. 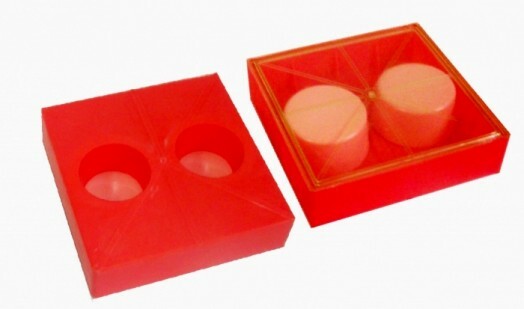 The one who does not want to make unnecessary expenditures can use simple feeder cans. Filled with syrup cans you just put on the frame. The syrup should be covered with a soaked in water strip of gauze. Bees will crawl on the gauze and not drown. Gauze covered with the crystals is easily washed in boiling water. Feeders that use air pressure. These feeders work on the same principle as drinkers, used in poultry. A small jar is filled with syrup and covered by standard plate. The upside-down pot with a saucer is a good feeder for bees. To make bees get enough syrup you put 3 – 4 matches under the bottom of the jar. During their placing the jar should be in inverted position. As the consumption of the syrup air comes in a jar. Of course, the described device is quite primitive. Better to make the feeder from the jar with the closed lid, in which you pierce 2 – 3 holes with a thin awl. Jar is filled with syrup and you close a lid. You set the jar in the inverted position with any device so that it is inaccessible to thieves-bees, but bees of the family can take the syrup from the holes. You make also lids with holes for feeding bees. Together with lids you can make or buy wooden bases, on which are installed overturned jars. Base is made so that the jar installed on it, is at a distance of 9 mm (0.35”) from the bottom of the central cavity. In the base there is a slot for connection to the notch of the hive. Feeder is attached to the hive by moving of the ledge of the stand in notches. This kind of device does not require opening of the hives. Beekeeper can immediately see that feeders are empty. He can load a wheelbarrow with jar and a few minutes later he can provide every family with syrup. This way of feeding is particularly convenient for periods without honey when the brood should be supported to enhance families. The family should be given every day about 0.24 liters of syrup. If bees receive this amount of syrup in the open feeder, they will eat it in an hour. Feeding in the morning or in the afternoon will cause unwanted stimulation of the family. Bees will fly out of the hive rapidly, to find out where the food source. If you feed so all the families, the roar begins in the apiary, often accompanied by attacking bees on weaker family or cores. Unprotected entrance is immediately attacked. Unless the family is not strong enough to repel attackers, the hive will be plundered. Bees can become angry and attack passersby and cattle when there is no syrup in the feeders. It is better to feed bees in the evening. Fortunately, you can avoid all of the troubles by using a feeder, from which the bees eat 1 liter or 0.5 liter syrup for the whole day. When feeding bees in the nucleus, it should be enough of this syrup for 36 or 48 hours. When the food comes very slowly, but gradually, the bees raise more brood than with an uneven feed. 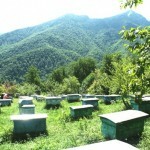 In the first case there is no hum, no stealing in the apiary. To tell you the truth, it is impossible to adjust the holes of ordinary jars so that the syrup does not go too fast. This is easily can be done in the presence of a tin can with an open lid and Boardman notches feeder system, on top of which you make only 3 – 4 small holes. 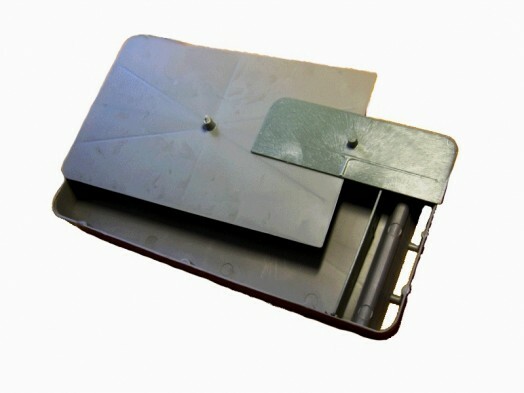 Tin with an open lid is the simplest and most convenient feeder for the bees in the winter. Filled with syrup jar with a tight fitting lid with many small holes you put down directly above the nest. Under the feeder, there is a sufficient space for movement of bees across the cover. In cool weather it should be warm syrup, and the bank must be wrapped with the burlap. Slow, feed intake is essential for maintenance of normal family activities for 2 – 3 days. A very slow feeding is better, so you can make one hole than a few. When feeding a powerful family it should be more holes than for poor families. In all cases, the syrup for feeding should be from 2 parts of water and 1 part of sugar. Stir syrup until sugar is dissolved.